You love cats and japanese culture? Then this is the right article for you. In this article we are talking about Maneki Neko aka Fortune Cat. Maneki neko has been a part of Japanese culture for a long time. 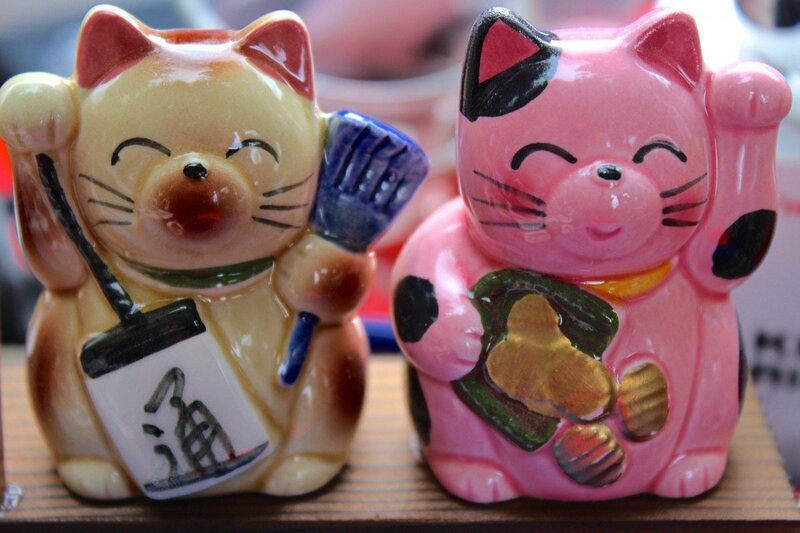 Japanese people have been using maneki neko as talisman or lucky charm. And, they are not the only one. Chinese people also use Maneki neko as lucky charm. Not only that, but they also use it as feng shui for their homes. Pretty interesting, right? But, many people have been wondering what is so special about maneki neko? Find it out in this article! When we translate maneki neko, we get beckoning cat (maneki = beckoning; neko = cat). Yes, maneki neko is, besides fortune and lucky, a beckoning cat. But, many people often call this cat differently. Besides beckoning, and also fortune and lucky, many people name them as money cat and welcoming cat. That is why many japanese store owners often put maneki neko at the entrance of their store. This fortune cat is beckoning customers. Maneki neko originated from later part of Edo period (1603-1867) in Japan. The earliest records of this lucky talisman were found in the year of 1852. They were found in paintings and people were selling them in some temples. Later, we can also find a mentioning of this fortune cat in newspaper articles. In the second period, Meiji Period (1868-1912), they began to appear more often. Many people connect its popularity with opening of Japan to West. Why? The thing is that japanese people had (and still have) lucky talisman sin the shape of male sexual organ. And they were quite popular. But, with opening of Japan to outsider world, japanese people had to preserve the image of Japan. Thus, the government prohibited the production and sale of artificial male sexual talisman. Because of that, maneki neko started to gain popularity very quick. This is a traditional maneki neko (fortune cat) color. It is important to mention that this type is considered the luckiest! And, three-color maneki neko is probably the most famous one. Why? Because male calico cats are really rare and having a male calico cat is really lucky! 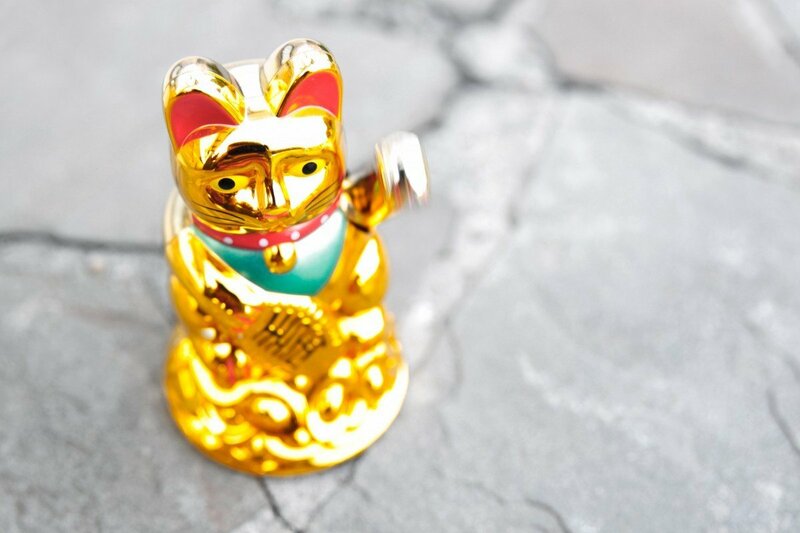 This maneki neko will bring you good luck, wealth and prosperity. White maneki neko (fortune cat) is also one of the most popular ones. People love white fortune cat because this type will bring you happiness and purity. Some also say that, if you have white talisman, you can expect positive things in your future. Another one that is quite popular is black maneki neko. This type will bring you protection. People believe that black lucky cat can ward off evil spirits. They can even ward of stalkers! Furthermore, some say that this type can also cure illness in children. All in all, black maneki neko will bring safety in your life. I think gold one speaks for itself. Gold is equal money and wealth. 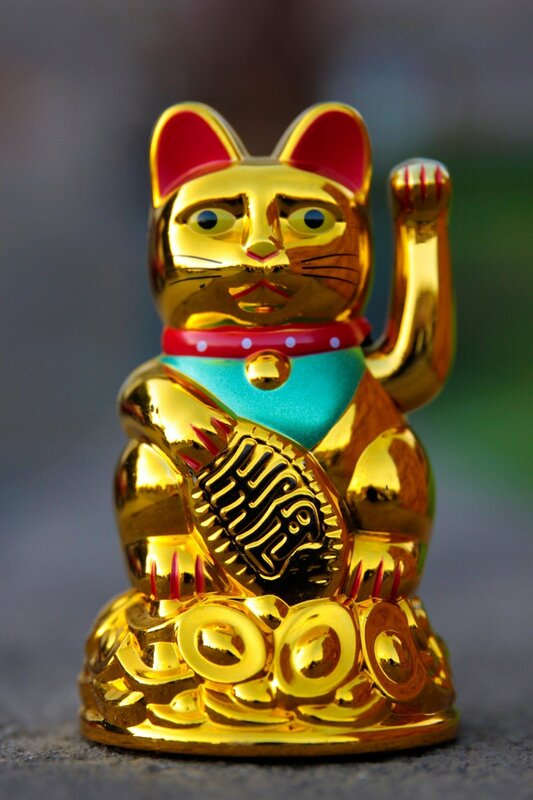 With that being said, you can conclude by yourself that gold maneki neko will bring you wealth and prosperity! When we talk about red maneki neko, there are some differences in people’s beliefs. Some say that red type will exorcise evil spirits and that it will cure illness. Similar to black one. But, on the other hand, others claim that the red ones bring success in love and relationships. If you are one of those people who think that there is nothing more important then health, then green maneki neko is the right one for you. Green one will bring you good health! Pink maneki neko is for romantic souls. This type will bring you love, happy and stable relationship and romance. Interesting fact: In the past, Japanese people thought that pink and red fortune cats had supernatural powers. Because of that, many people avoided them. Maneki neko fortune cats can have their left, right or even both paws raised. And, yes, there is a different meaning between all the three types.When it comes to left and right paw, it is important to mention that there are also some differences in people’s beliefs about its meanings. Nevertheless, we have listed below the most common meanings of raised paws. Maneki neko fortune cats with their left paw raised are most common. Around 60% of all fortune cat statues have their left paw raised. This type is perfect for businesses. It will attract customers in your store. Because of that, if you have some kind of store you should put maneki neko beside the window or at the entrance of the store. With that, you can sit back and watch customers coming in. Your maneki neko (beckoning cat) will greet them. On the other hand, maneki neko with its right paw raised, is most commonly used at homes. This type of fortune cat will bring you economic fortune. In other words, it will bring you money. It is also said that fortune cat with raised right paw will bring you success and prosperity. Maneki neko fortune cats with both of their paws raised are most rare ones. But, they are also popular since both raised paws represent protection. Pretty great, right? Many people are asking how does maneki nekos paw/paws wave? The thing is that they work because of the batteries. Some of them are even made with solar-powered moving paws. Interesting fact: The higher the paw of maneki neko is, the better. Why? Higher paw means more expansive reach of maneki nekos fortune or luck. We can often find maneki neko (fortune cat) holding and wearing certain items. And, every item that maneki neko holds has its own meaning that can be tracked all the way back to Edo period. Firstly, we can find this japanese fortune cat holding a golden coin. This golden coin is called „koban“. Koban is an old japanese coin from Edo period. Some even say that koban held by maneki neko is worth about one million ryō (ryō is old japanese currency; todays currency is yen). Talking about fortune! And, people believe that this fortune cat holding a coin will bring you wealth and material abundance. Furthermore, you can often find fortune cat wearing a bib or a collar (usually the red ones) and a golden bell. And, it is all because of the fact that wealthy people from Edo period had a tendency to dress their cats like that. It is also important to mention that in Asian cultures, gold and red are considered as celebratory colors. So, this might be a reason of maneki neko wearing red collar and golden bell too. This bib, collar and bell could be related to protection. But, they can also bring wealth and material abundance. Some of the other items that maneki neko can hold are magic money mallet, fish (usually a carp), a marble or gem, gourds, prayer tablets, daikon radishes and ingots. And, these items all attract good fortune, wealth, wisdom and good luck. This legend talks about poor priest, his cat and the rich federal lord. And here is how the story goes. Once, there was a poor priest who lived in a Gōtokuji Temple with his beloved cat. He didn’t have much goods and he had very little food. One day, a rich federal Lord Ii Naotaka of the Hikone district was passing by. But, there was a huge storm. Because of that, the lord decided to hide under a tree and wait for the storm to end. Suddenly, he saw a cat standing at the entrance to the temple. This cat was waving with its paw. It even looked like the cat was calling the lord to come near. Thus, the lord decided to come. The moment lord came near the cat, a thunder striked the tree. This cat saved his life! Soon, this lord became a patron of this temple, and with that he brought prosperity to the temple. When the cat died, they made a statue to honor her. Today this statue is called maneki neko. A geisha named Courtesan Usugumo had a pet tortoiseshell cat. She lived in a brothel of Miura Yashirōzaemon. One day, the cat started to claw on her kimono. But then, here comes the owner of a brothel. When he saw the cat tugging at geishas kimono, he thought that the cat is possessed. Because of that he beheaded the cat with a sword. Cats head flew to the ceiling and killed the snake that was hiding and getting ready to attack. In this legend, a cat, once again, saved a life. Geisha was really upset and sad because her cat was gone. But then, the owner of a brothel carved a statue that looked just like Usugumos cat. Soon, everyone wanted to have the same statue, todays maneki neko. There was a poor woman who lived in Imado. She had a cat. But, soon, she was no longer able to take care of the cat. Because of that she had to give her away. One night, her cat appeared in her dreams. The cat said to woman that she should make cat image (looking just like her) in clay. The woman followed cats advice. Not much time later, people started to take interest in the clay statue. They even wanted to buy it. Because of that, woman made more cat statues. Soon, she wasnt poor anymore. Cat statues brought her fortune. Maneki neko is so popular that people are making them for all sorts of purposes. They are not just statues standing at the entrance of stores, businesses and temples. They can also be piggy banks, key chain, decorations etc. Anyways, if you decide to get this lucky talisman for yourself, you can’t get wrong with it. It can bring you luck and fortune. And if that’s not the case, it will surely look cute wherever you put it. The Pokémon named Meowth is based upon the maneki-neko. In western markets, maneki neko is made with its paw facing upwards, which is more familiar beckoning gesture to western people.